SELL ACTIVITIES IN THE MONTH OF JANUARY 2018! The beginning of the year for many is a time of reflection over what has happened in the previous year and preparation for the task ahead. As a matter of priority, SELL gives special attention to planning and advocacy visits as means to reaching out to the communities. 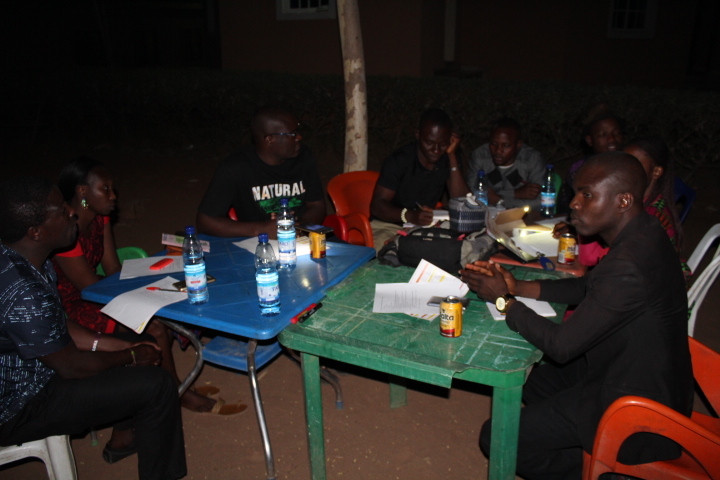 The office resumed on the 4th of January, since then, a lot of activities have been carried out. 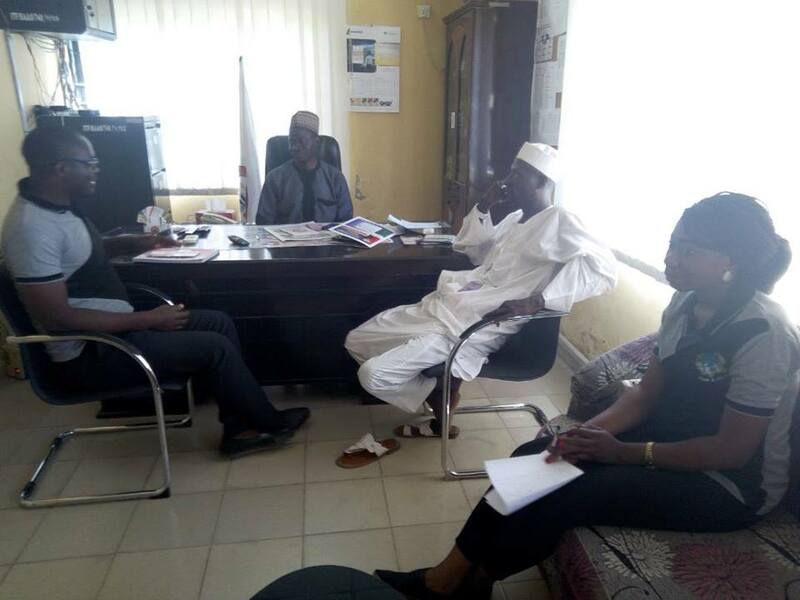 In our desire to reach out to the vulnerable people, the Foundation continued with the discussions that started in 2017 with the authorities of Bauchi state Prisons about extending SELL programme to the inmates on the 9th of January, 2018. 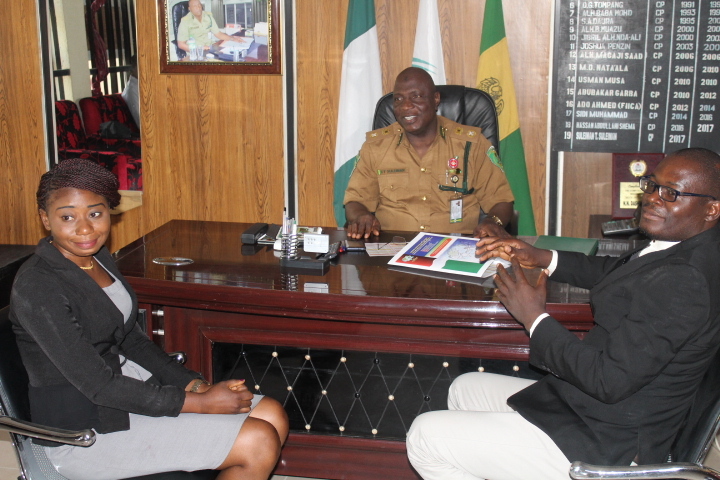 During the meeting, Controller Suleiman I. Suleiman expressed gratitude to the Foundation for the good intention to help with the reformation of the inmates and sensitization of people in the community against stigmatization of ex- convicts to enable them reintegrate into the society. He said that their doors are open to organizations with good intentions such as SELL Foundation. In furtherance of the visit to the Bauchi State Controller of Prison, the SELL Team visited Bauchi prison and was received by the D. C and his men. The purpose of the visit was to create awareness on SELL programme to the prison officials. The team had an interactive session with the prisons staff who sought to know the kind of intervention the foundation will give to the inmates. The team reeled out the different thematic programme areas to cover with the inmates and also received suggestions on some areas of needs of the inmates. After the interactive session with the prisons staff, the team was taken round the prison Yard for familiarization. Among the facilities visited is the woodwork workshops where the inmates make different kinds of furniture with the help of their instructors who are themselves staff of the Nigerian prison service. Other places visited are the Barbing shop, Tailoring and Handwork sections, where inmates make/ learn haircuts , sew clothes and make local head caps/hats of different designs respectively. The inspection of facility no doubts opened our eyes to the good work the inmates are able to do with their hands, as well as the serious needs for equipment to help the inmates and their instructors do more. There is also the need to patronize the products made by the inmates. 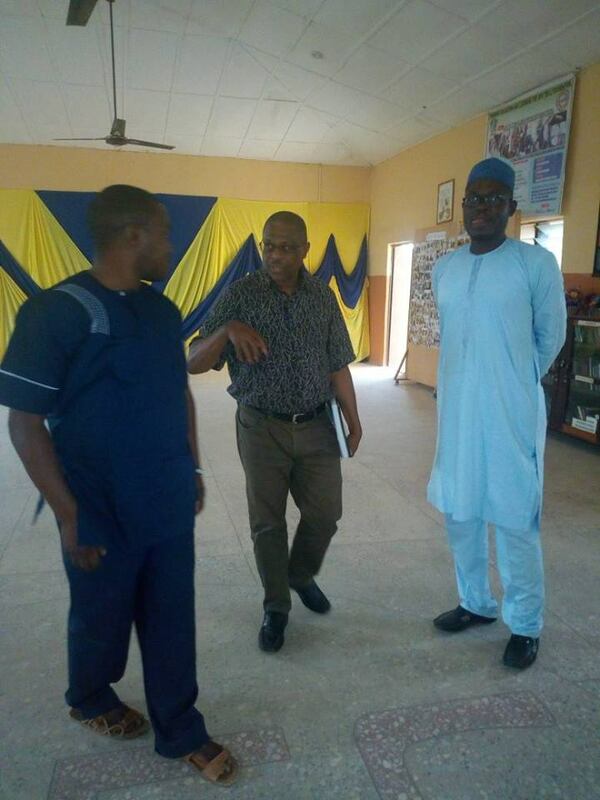 Similarly, the Team visited the new ITF Bauchi Area Manager Mr. Richard Baba on that faithful day .The visit aimed at consolidating the existing collaboration and clarified on further areas of focus in the next Training of SELL Programme. The new Manager expressed his joy on the good work of SELL Foundation and promised to extend same support as already started by his predecessors. The presenter began by saying self motivation is the ability to do what needs to be done without influence from other people or situation. He added that people who are self motivated find reasons and strength to complete their tasks in spite of challenges without necessarily waiting for encouragement from others. 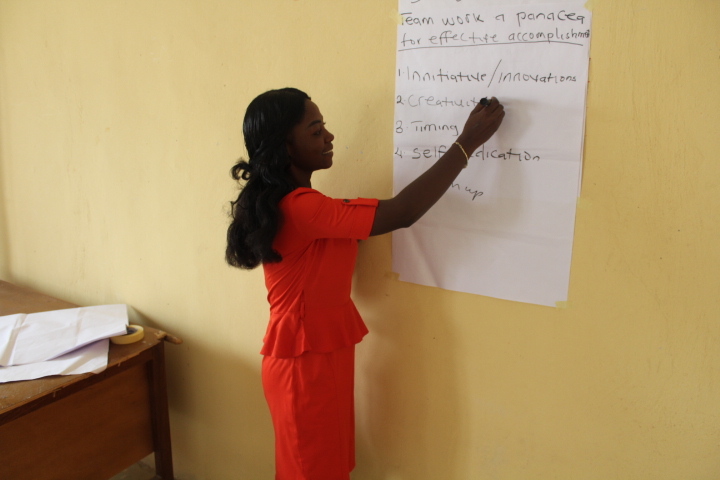 SESSION TWO: Team Work, a Panacea for Effective Accomplishment. (By Emily Yinala). Team work is the oil that makes the team to work. We at SELL FOUNDATION believe in the virtue call TEAM WORK. After all, it is not the team with the best players that win but players with the best teams that win. 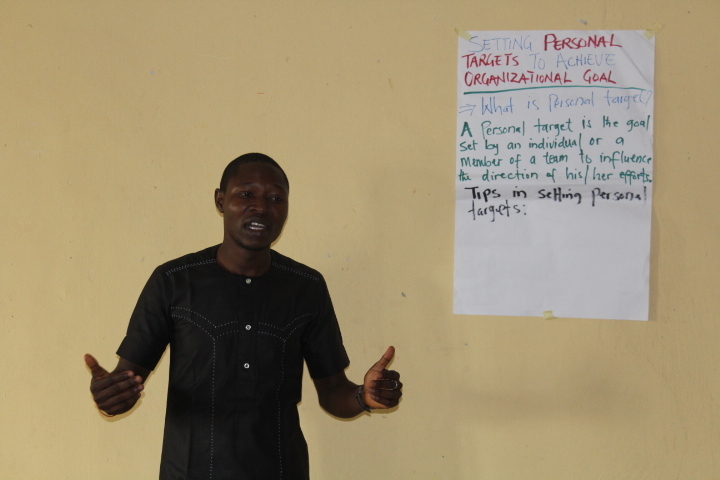 The presenter began by defining personal target as the goal set by individual or a member of an organized group to influence the direction of his or her efforts. He added that for you to achieve your goals, you must set the smart rules of goal setting. Your goals must be Specific, Measurable, Achievable, Relevant and Time-bound. 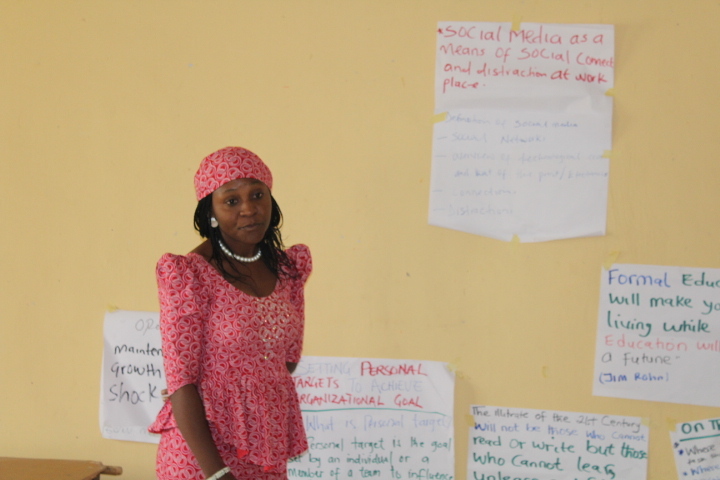 The session began with inputs on the key term. Learning on the job is a situation where learning a new skill or process happens within the normal work environment. For you to excel in your work, you must make your passion your profession and develop passion for your work. Social media as a computer mediated technology is the creation and sharing of information, ideas, career interest and other forms of expression via virtual communities and networks but when it is used at inappropriate times, it can constitute a distraction and low productivity at work place. This session was the last of the presentations. 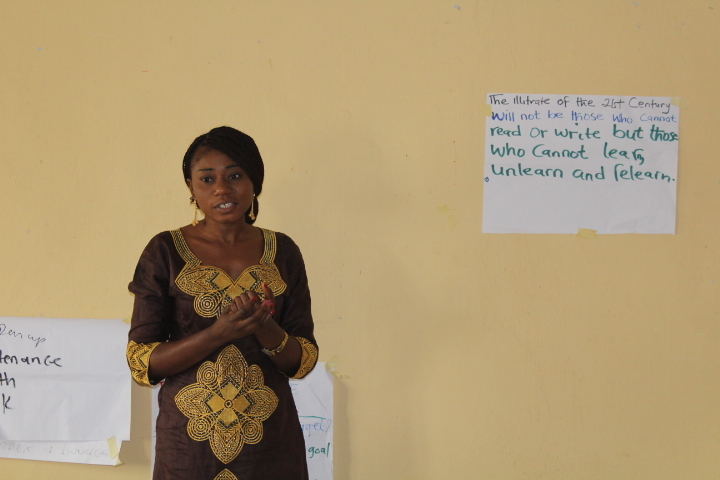 The presenter engaged the Team members with brain work by given them questions to ponder on. 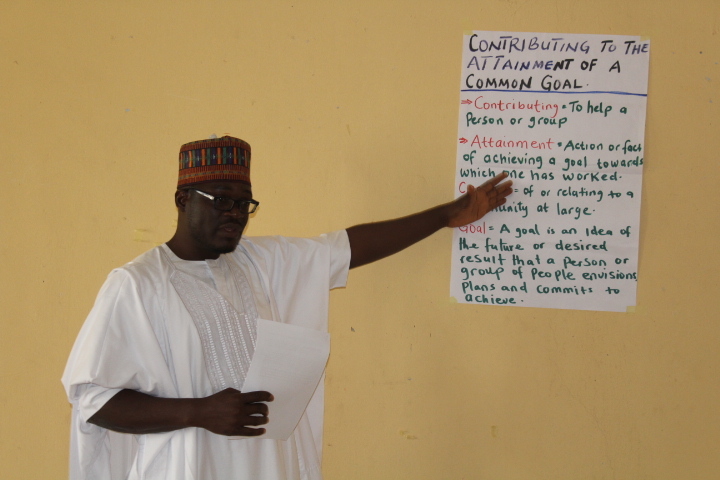 Thereafter, he gave the definition of the key words; Contributing, Attainment, Common, and Goal. Finally, the month of January ended for us at SELL Foundation with the visit of Mr. Lincoln Ndogoni, a Psychosocial Adviser/Counselor from Kenya who was on Evaluation visit to some Catholic Priests sponsored by Missio Germany who attended a Trauma Healing course in Kenya. 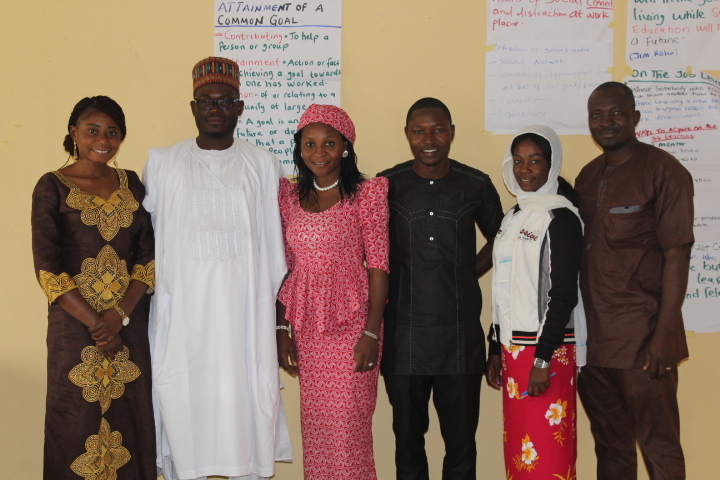 He commended the good works of SELL and for integrating Trauma and Psychosocial support fully into the SELL programme. He promised to share materials to support the work of the Foundation in the aspects of Trauma and psycho-Spiritual support. He was accompanied by Fr. Gregory Zungdet and well received by the Resource Team Members. Thank you for staying with us on this page. Emily Ranna Yinala, Communications Desk, SELL Foundation.